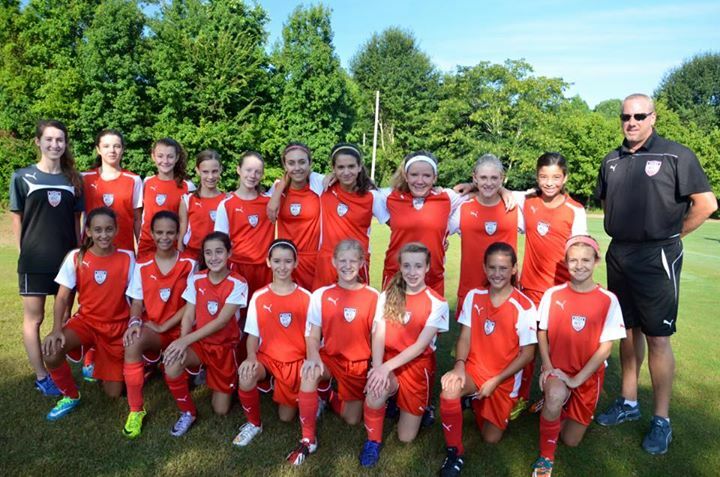 Last weekend Sydney played in the first of two pre-season tournaments. First up was the Nike Cup. The girls played this tournament last year and let me tell you the improvement from last year to this year was pretty impressive. Last year we basically got slaughtered as it was the team's first time playing 11 v 11. Plus we were pooled with some of the best teams in the state. It was rough! This year though was a different story. The girls held their own and played amazing. They won one game and lost two, BUT the scores were close. I was so pumped to be back at the fields cheering on this group of girls. I love watching them play! The girls are now playing U13 Select at the Athena C level. The team's goal is to play Athena A by the time they reach U15 and if they keep working hard I think this is a very attainable goal. Beat her to the ball! One of Sydney's strengths is that she is FAST! I love that she is not afraid to battle even if the girl is like a foot taller than her. She is tough and fierce! I love this group of hard working girls. Next up is a pre-season tournament for Jordyn. She moved up to Academy and is playing with the U10 group. I can hardly wait to see her play this weekend!! She has 2 games Saturday and at least 1 on Sunday. Her team is playing at Braly Soccer Park so if you want to come cheer her on let me know and I'll send you the game times.